Our most popular bumper sticker: Got Milkweed? While the California Milk Processor Board has used the weight of copyright law to stop us from printing the phrase “got milkweed?” on any products (petty, no? ), they haven’t put the kibosh on “got Asclepias?” This educational bumper sticker with our exclusive illustration has become our most popular invention. Order your own from this link. Posted in INVASIVE species, PRODUCT profiles. Tags: "Got Milkweed?" Monarch butterflies. 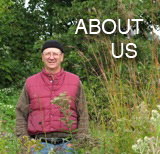 Comments Off on Our most popular bumper sticker: Got Milkweed?